In the 12th century they also made use of such illustrations. One of these you see here, made by a brilliant abbess, Herrad of Landsberg. But this one is quite different from the ones we see today. At the bottom we see the Leviathan, a mythical sea monster, a symbol for all that is malicious and evil – also called Hades, the realm of death, Death. We humans are like fishes shivering and shuddering at the sight of him. But God has a plan to save us from this evil beast. At the top left you see God with… indeed, a fishing rod! 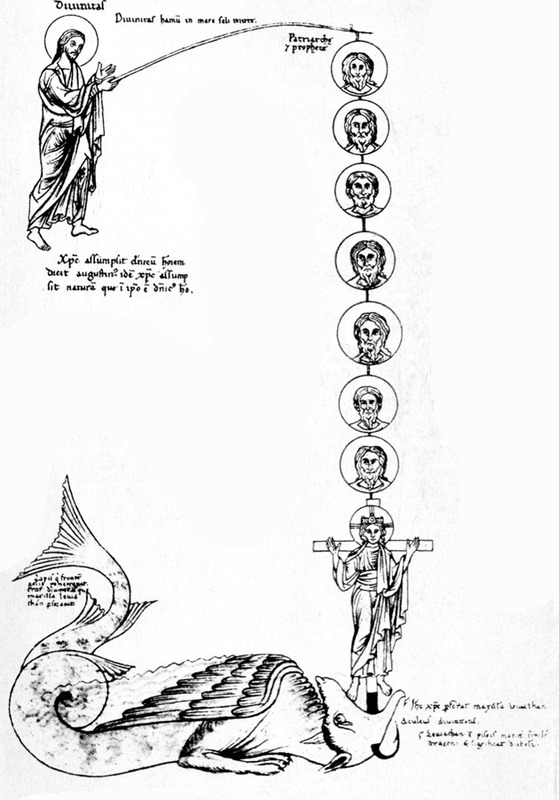 Hanging from it is a so-called Tree of Jesse: the genealogy of David leading up to Jesus. In other words, God makes use of our human history to fulfill his plan. At the end of the line we see Jesus disappearing into the mouth of the Leviathan. Jesus is swallowed up by evil, but consequently proves to be stronger and conquers it. He is like bate, which first appears to die when the predator bites, but then a hook turns out to be within the bate – in the form of a cross – which allows the angler to catch the monster and pull evil out of the world. This is the gospel according to Herrad. Jesus was familiar with all our grief. Just like us he was swallowed by the ‘Leviathan’. But he was the first in history who could handle this! He resisted the temptation to sin and his body could not be wiped out. Since then we know where to look, when we want to know the most beautiful thing that has ever come our way. We know that evil was conquered then and that this can happen again. That is good news indeed. Herrad of Landsberg: ‘Leviathan’, Hortus Deliciarum folio 84 r, ca. 1170, Strasbourg, now destroyed. Herrad of Landsberg (c. 1130 – 1195) was a 12th-century Alsatian nun and abbess of Hohenburg Abbey in the Vosges mountains. She was known as the author of the pictorial encyclopedia Hortus Deliciarum (The Garden of Delights). She was born at the castle of Landsberg, the seat of a noble Alsatian family. She entered the Hohenburg Abbey in the Vosges mountains, about fifteen miles from Strasbourg, at an early age. The Hohenburg Abbey, also known as Mont St. Odile, was run by Abbess Relinda, a nun sent from the Benedictine monastery of Bergen in Bavaria to Hohenburg Abbey. Due to her support from the Holy Roman Emperor Frederick Barbarossa the abbey was extremely successful and powerful, as well as a source for reform. At the abbey Herrad received the most comprehensive education available to women during the 12th century. As she grew older she rose to a high position in office at the abbey, and was soon put in charge of governing and educating her fellow nuns. After Relinda’s death, Herrad was elected abbess in 1167. It was at this time that she began her work on the Hortus Deliciarum. Herrad was abbess for 28 years, and continued in that office until her death in 1195. The Hortus Deliciarum (written 1159-1185) is a compendium of all the sciences studied at that time. It was written as a compendium for the women in Herrad's convent, in order to further learn biblical, moral, and theological material. The original manuscript consisted of 648 pages on 324 parchment sheets. The majority of the work is written in Medieval Latin, with approximately 1250 glosses in Old High German and Middle High German. Its chief claim to distinction is the three hundred and thirty-six illustrations which adorn the text. Many of these are symbolical representations of theological, philosophical, and literary themes; some are historical, some represent scenes from the actual experience of the artist, and one is a collection of portraits of her sisters in religion. The technique of some of them has been very much admired and in almost every instance they show an artistic imagination which is rare in Herrad's contemporaries. While other artists and writers contributed to the Hortus Deliciarum, it was largely compiled, written, and edited by Herrad. Many of the poems and hymns were written by Herrad, and it is speculated that much of the art was created under the direction of Herrad as well. After having been preserved for centuries at the Hohenburg Abbey, the manuscript of Hortus Deliciarum passed into the municipal Library of Strasbourg about the time of the French Revolution. There the miniatures were copied by Christian Moritz (Maurice in French) Engelhardt and published by Cotta in Stuttgart in 1818. The original perished in the burning of the libraries of the Protestant seminary and the City of Strasbourg during the siege of 1870 in the Franco-Prussian War. Reinier Sonneveld (b. 1978) makes his living by writing theological books. He was the youngest writer in the Netherlands to receive the Prize for the Best Christian Book and sold a quarter of a million copies. He is also a member of the board of ArtWay.